Rogue One, the first of a series of Star Wars “anthology” movies adjacent to the trilogy films, arrived in theatres last week. Here’s what the scrappy rebels at Deadshirt thought. Spoilers ahead. Rogue One’s an unusual beast in that, after three despised prequels, it’s the Star Wars “origin” movie fans really wanted from George Lucas back in the 2000s: the tale of how the Death Star plans came to be acquired by The Rebellion, long hinted at but never seen until now. It’s The Story Behind Star Wars (or A New Hope, if you wanna get pendantic) as we know it. Here’s the deal with Rogue One: When it’s great, it’s great, but like the Empire’s deadly moon-sized superweapon, it unfortunately has some critical flaws. Rogue One’s ensemble cast is rock solid, with strong performances from Riz Ahmed, Donnie Yen, Mads Mikkelsen and Alan Tudyk (as the voice of killer comic relief droid K-2SO). The real problem is that our ostensible lead, reluctant rebel Jyn Erso (Felicity Jones), doesn’t have much of a character, or at least enough of one to really latch onto in the way you might Ahmed’s remorseful, haunted ex-Imperial or Yen’s cheery zen force-worshipper. This isn’t on Jones, who does the best she can with groaners like “Rebellions are BUILT on hope!” but it’s sort of a bummer that a great actor isn’t given more to do in a pretty bog standard action role. Honestly, the real star of Rogue One is Ben Mendelsohn’s slimy Director Krennic. Mendelsohn’s performance as a sort of put-upon Imperial middle management is inspired: He’s funny, menacing and weirdly vulnerable all at once. Mendelsohn’s Krennic is a psychopath in the mold of William H. Macy in Fargo, a loser with delusions of greatness, fucked over by his own dark ambitions. When Mikkelson’s pacifist Death Star architect tells him he’s confused peace with terror, Mendelsohn’s “Well, you have to start somewhere” is the perfect encapsulation of the Empire’s particularly mundane brand of fascism. The true strength of Rogue One is that it’s a movie bold enough to kill off its entire main cast in a bleak but ultimately hopeful ending. On a practical level, the film obviously has to explain why Jyn Erso and co. aren’t around to fight in the original trilogy but it’s still a pretty fearless beat to end a $200 million dollar blockbuster on. While imperfect, Rogue One bodes well for the integrity of Disney’s future Star Wars spinoff films. The core Star Wars films are about a handful of individuals (primarily the Force-selected Skywalker family) dramatically affecting the course of history. But what makes Rogue One a rewarding experience is the way it celebrates the importance of every man, woman, and droid who stands up to fight in the Rebellion. Rogue One is the story of Jyn Erso, of course, an exceptionally brave and competent fighter, and the band of Rebels who she leads on a suicide mission to steal the Death Star plans, but it’s not about how special Jyn is. The film’s climax makes a point to demonstrate just how many people it takes to win the war. Rogue One’s final minutes track the Death Star plans from the doomed base on Scarif, up to a Rebel command ship under siege by the invincible Darth Vader, where the fate of the galaxy hinges on one nameless guy handing off a data disk through a crack in a jammed airlock hatch before he can be run through by a lightsaber. Galen Erso built a flaw into the Death Star, he saved the galaxy. Jyn Erso stole the plans, she saved the galaxy. Bodhi Rook patched the transmission. Chirrut Îmwe flipped the Master Switch. That guy whose face we don’t even see, he hands off the plans onto the Tantive IV, where Leia Organa will hide them inside of R2-D2. They all saved the galaxy, and it took every single one of them. I find that very affecting, and I suspect that the next time I watch A New Hope, when I see Luke Skywalker fire that fateful torpedo, that victory will feel all the more meaningful. Rogue One is a film that is adapted from a few lines of text that first appeared in the opening crawl of 1977’s Star Wars, just Part 4 of a now soon-to-be-9-part epic about good vs. evil in space. It’s the first entry in the series that doesn’t focus on the Skywalker family or even Jedi (although it adds to the mythology of the Force in new and interesting ways through Donnie Yen’s blind warrior monk Chirrut Imwe). What I loved about the film was that how it felt simultaneously different and familiar, focusing on character archetypes that we haven’t seen in the franchise without sacrificing what makes the series work. And instead of the same old good vs evil dichotomy, this entry presents the Star Wars universe in shades of gray for the first time. 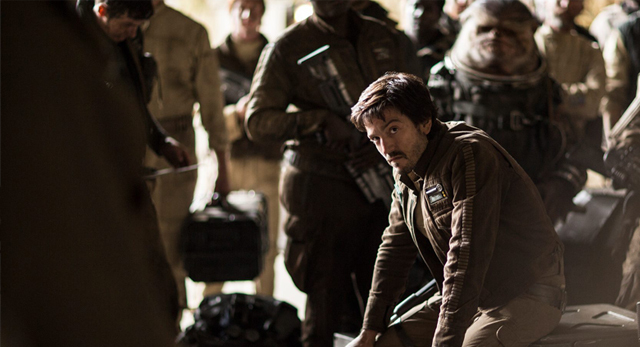 Members of the Rebellion, such as Diego Luna’s Cassian Andor and Whitaker’s Saw Gerrera, are presented as assassins and terrorists. Bodhi Rook (Riz Ahmed) is a former Empire pilot but his meek, humble nature makes him the heart of the team. Mikkelsen’s Galen Erso, the scientist who designed the Death Star, is a loving father to the film’s central protagonist, Felicity Jones’ Jyn. The film doesn’t quite match the mythos and grandeur of last year’s The Force Awakens but it expertly bridges the gap between the craptacular prequels and the original films. The final battle sequence, in particular, might be my new favorite sequence in any Star Wars film ever. If there are any gripes, it’s that the film gets too bogged down in fan service-y moments and pointed references to past characters throughout which makes the final sequence (an amazingly crafted prologue to A New Hope) lose a bit of its luster. Still, this is the only Star Wars prequel that bears any sustained emotional resonance and that shines a bright future to any further entries in the Star Wars Story sub-franchise. Oh, and we get to see Darth Vader’s house and it freaking rules. A few weeks before Rogue One’s release, a friend of mine and I were discussing how welcome the film’s diverse cast was, but she had one qualm. That as many shades of humanity were represented in the film’s marketing materials, the whole shebang is still fronted by a white woman. There’s one sole woman of color in the movie’s two hour-plus run time, and she has a few lines of dialogue drowned out around the Rebel Alliance’s oversized meeting table late in the second act. Everyone passes around the metaphorical Conch Shell, taking turns naysaying and harumphing, but she’s essentially just in the background (though there will be whole tomes of fanfiction surrounding her on Tumblr by week’s end). As much as I enjoyed the film, as you can see in my full review elsewhere, the lack of women of color stood out in my mind. It’s still I think one of the film’s greatest weaknesses, but Felicity Jones (who does a fine job with what she’s given) fronting the film was almost worth it for me in one specific scene. When Jyn is lecturing Cassian over the whole “lying about being sent here to murder her father” thing, the logic behind why she’s upset is sound, but her delivery reeks of a kind of selfishness. Of course, her father just died in her arms and she had to leave his still-warm body behind in some wreckage, but something about her words just rubbed me the wrong way. It’s shoddy writing, but I realized it was less character motivated and more primed as a volleyball serve for Cassian to “go awf” about her selective passion for revolution. His quick little screed about some of us not having a choice in war and being born into this kind of struggle felt like a great many lengthy social media rants I’ve read in the days since the election, only it was happening on a spaceship in a galaxy far, far away. I love dogfights in the sky and droids shooting blasters as much as the next guy, but there’s something really sweet about an unintentional teardown of white feminism taking place in a Star Wars movie that’s going to stick with me far longer than any of K-2SO’s owns. Rogue One is now playing. You’ve probably seen it.